Forgive me, but I am very pleased with my capture here of a fresh Striped Hairstreak butterfly. Tiny, like all hairstreaks, it startled me when I first eyed it. I was looking for the usual larger butterflies, in the Powdermill Reserve of the Carnegie Museum of Natural History, in Rector, Pennsylvania. 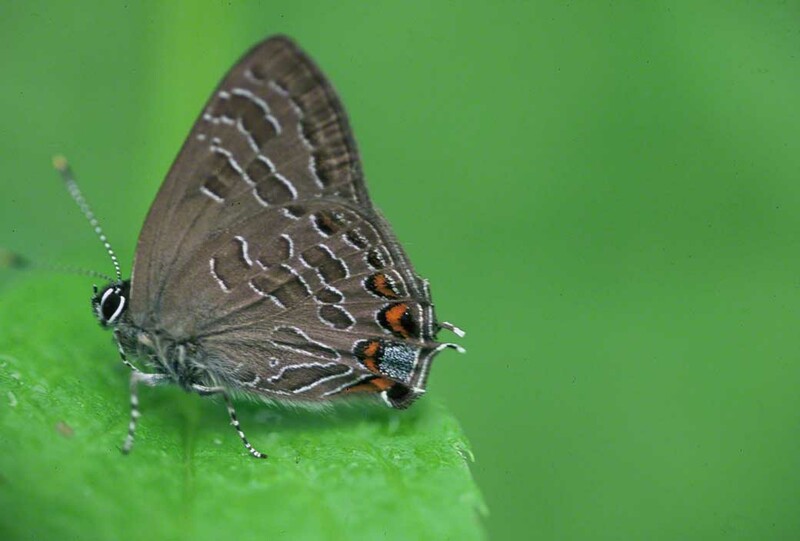 Rector is in the sylvan Laurel Highlands of south-central Pennsylvania, and finding such a tiny, “Rare-Uncommon” butterfly there, should not have been a surprise to me. When my Macro- lens came closer and closer to this beauty, it remained in place, and I marveled at how magnificent it was. A shmeksy! butterfly that is never found in abundance, and is alway seen as a solitary specimen, alone, naturally. This is one of my early finds, and Yep, it stoked my passion to work to find and shoot common and uncommon butterflies, fresh, colorful and reminders of the Gift that we continue to receive. Just today, a FB friend posted an image of a Great Spangled Fritillary Butterfly, ID’ing it as a Meadow Fritillary. That reminded me of how fortunate I have been to have seen several Meadow Frits in these many years in the field. Here’s a male Meadow Fritillary that I met in the reserve of the Powdermill Wildlife Refuge in Rector, Pennsylvania (the Laurel Highlands in central Penna). There was a summer once when I was there almost every morning, ’til a hostile Director told me to not ever come back. Powdermill habitat is rich in wildlife, e.g. that’s where I met my first Eastern Timber Rattlesnake . . .
Meadow Frits are small, fly with dainty grace, just inches above the ground. They appear fragile, with that tiny head, and have those oddly arched wings. What thoughts shoot through your mind when your trail brings you to this? It’s August in Powdermill Refuge in Rector, Pennsylvania (45 minutes southeast of Pittsburgh). You’ve already noted several large webs, all spun here by Black and Yellow Argiope spiders. Webs were notable for their composition. Each seemed to have its own unique design. Some held tiny insects, other webs, web strands, naked. This web. Oh, look. Location. location, location, as your realtor will tell you. This female Argiope has the Laurel Highlands equivalent of New York’s Madison Avenue & East 57th Street or crossroads in London, Paris, San Francisco, Mumbai or Munich, the last 5 of which I do not yet know. This early morning view is an eye full, and a little upsetting. Her strong protein fibers have captured and held an Elisa Skimmer (“widely distributed in northern states and Canada, but seldom becomes abundant” – National Audubon Society Field Guide to North American Insects and Spiders) and a grasshopper I am not able to identify. 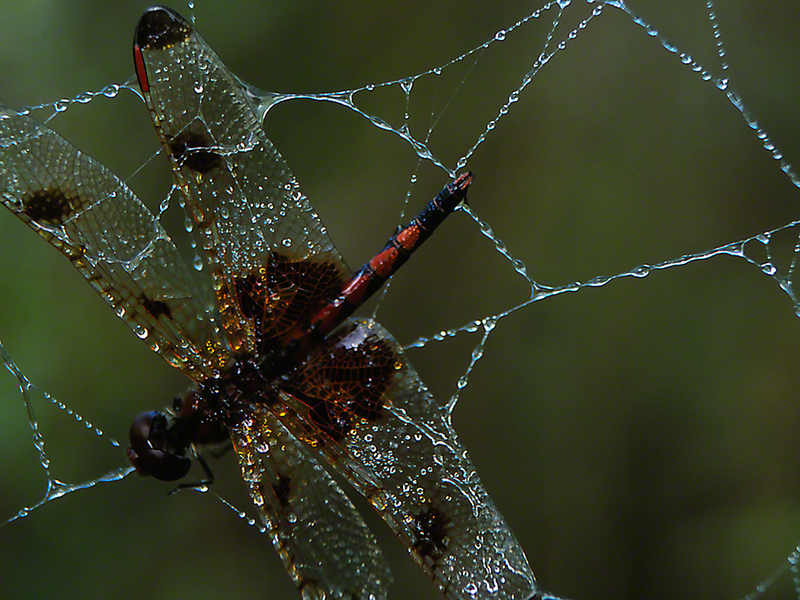 The grasshopper has been skillfully wrapped around in numerous web threads, the skimmer has not been wrapped. Both are still and surely gone. Dreamers who aspire to piloting swift jets daydream of flying with the skill of Elisa skimmer. Field and track athletes certainly admire the feats of a grasshopper. All the soaring and jumping . . . stilled by those mighty threads. What think you of this scene? NB, I thoroughly admire Argiopes and orb weaver spiders, complicated as these situations can be. 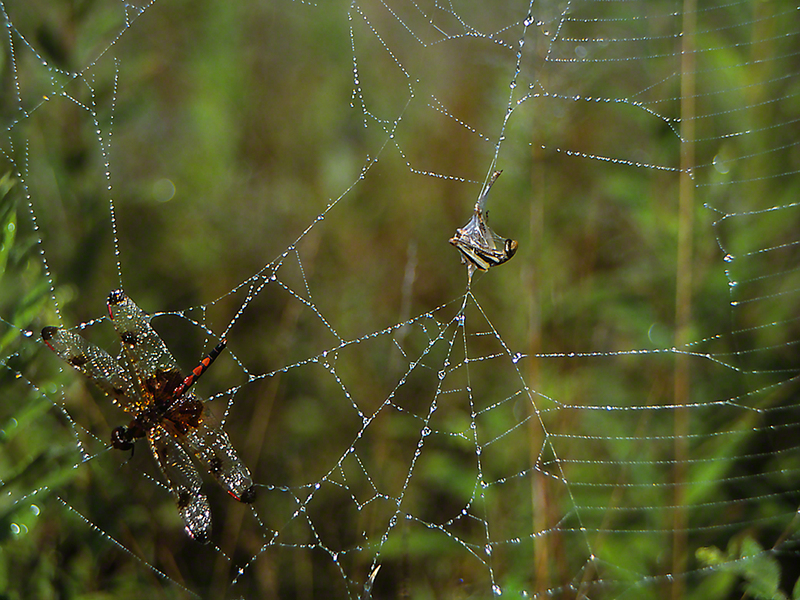 Also, that morning, I saw no butterflies in webs. To be honest…Good. Who? What? Where? & When? 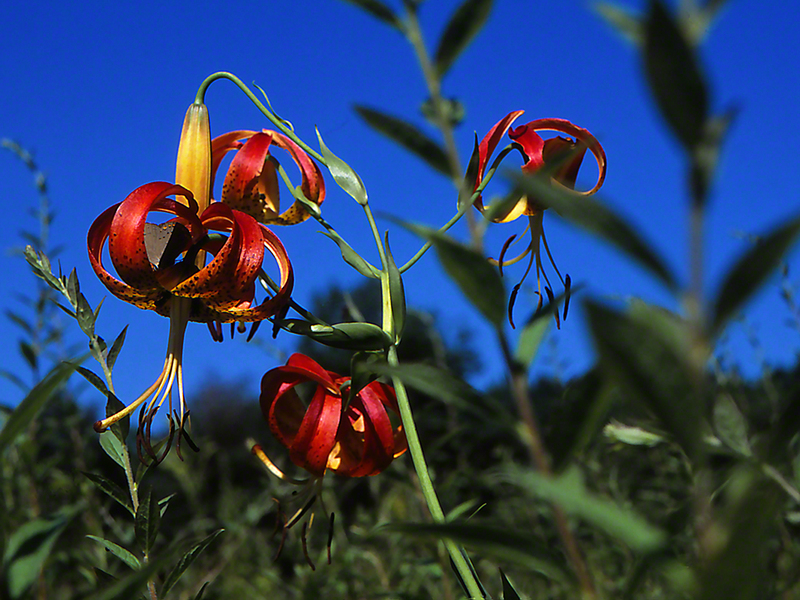 Turk’s Cap Lily in all its finery at Powdermill Nature Reserve in Rector, Pennsylvania. Meeting this spectacular native lily, at peak of bloom, stops you. You simply stop and stare. Stark beauty, headier than the work of Heade or the most accomplished Japanese or Chinese masters. Hairstreak butterflies must also be moved by the artistry of these flowers and by the elixirs that they exude, because Grays and Corals can be found positioned in these sizable flowers. Now, I have recently read more than a handful of excellent books, written by and about the most renowned lepidopterists. More than impressive is their knowledge of the behaviors, locations and diet, mating and intricate life histories of many, many butterfly species. Yet I have noticed something that we should know, and want to know, eludes us. At the same time, I have come into contact with more and more biologists, horticulturists, landscape designers and butterfly enthusiasts. Still, it’s still missing. I began thinking about it in Israel, on that agricultural road between the fields of Binyamina. It was when those Caper Whites and Large Salmon Arabs would appear, 3 to 5 individuals at a time, nectar furiously on Camphor Weed, and then they’d be gone…only to reappear 15 or so minutes later. They reappeared together, at the same time. What clock, signals, sun angulation…why, how, who…? I wondered. Wondered about what I was seeing. Amazing. It is 2014, we have been noticing and studying butterflies for more than 100 years. We have elevated gardening, and most recently, gardening with native wild flowering plants, to such an extent, that 10’s of millions of home gardens are now including plantings that nourish local fauna. But, it’s still missing. We have no idea when our regional butterflies will fly in to feed. We have no idea why they will appear as they do. We have no idea which butterflies will be there at this time or that. Don’t know where they will fly to. If it is 10:10 AM in your garden, whom might you expect to come to visit, from that nearby stand of trees? Wouldn’t it be 2014-ish if we, any of us, knew these things? Are our winged beauties programmed for such things…or do they fly by circumstance?